Please tell me you love sushi too. I love love sushi. It is one of those foods that we don’t eat on a regular basis so I get crazy intense sushi cravings. A few weeks ago Alex was such a sweetie and picked up sushi take out for me. ItÂ satisfiedÂ my sushi craving for a few days. 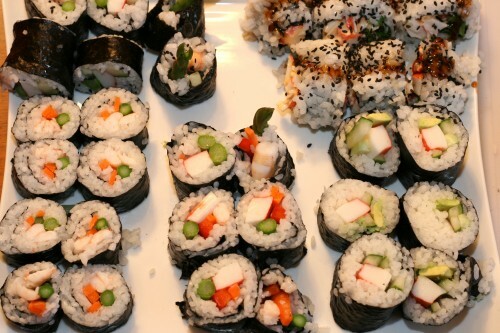 A few years ago we attended a make your own sushi party at a friend’s house (I made green tea ice cream). That was the first time I ever tried to roll my own roll. I did it and it stuck together and it tasted delicious. I was inspired. 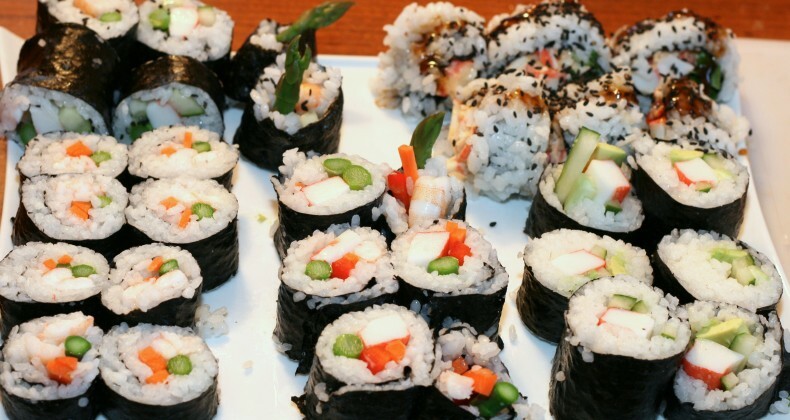 Last summer we made our own sushi at home for the first time. It was successful and it wasn’t until after I stuffed the last piece in my mouth that I wished I would have taken photos to share with you. If you like raw fish you may be lucky enough to find sushi grade fish at your Asian market or other good grocery store. I like raw fish sushi but decided to leave that the pros. We had spicy crab, shrimp, and various veggies (cucumber, red bell pepper, blanched asparagus, cilantro, carrots, and avocado) in our rolls. The sushi place here in town has a delicious roll with spicy crab and topped with eel sauce. Mmmm I love that eel sauce. I *had* to figure out how to make it at home. After some Googling I found a recipe that I halved. It was darn close to what they serve at Blue. For the rice you need to use a short grain rice and you must rinse it, and rinse it again, and possibly rinse it again. Why all the rinsing? Short grain rice is super starchy which is good and bad. Good because the starch is what helps make the rice stick together. Bad because it is too starchy and if you don’t rinse it until the water runs clear you will have mushy glumpy rice. Not good. So give that rice a good rinsing. Once the rice is cooked you will gently fold in a seasoned rice vinegar. This gives the sushi rice the sweet/tart flavor. The nori seaweed wrapper can be found in the Asian/International food aisle in most grocery stores (at least in my town) or they certainly can be found in a dedicated Asian grocery store. A bamboo sushi rolling mat which I bought at the Asian grocery store, but if you have bamboo placemats you may be able to use that in a pinch. 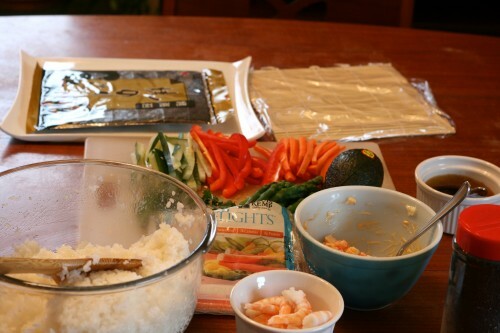 Cover the mat with plastic wrap to prevent the rice from sticking to it. I decided to use cooked shrimp and cooked “crab” flake as my meat. Thinly sliced vegetables filled up the rest of the rolls. Since I am making these I filled them up with our family’s favorite vegetables so I encourage you to use what you love. First wrap your bamboo mat in plastic wrap. 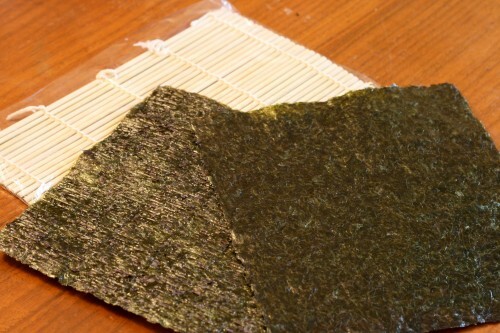 Place a sheet of nori onto your prepared mat. Nori has a rough side and a shiny side. You want to put the shiny side down. 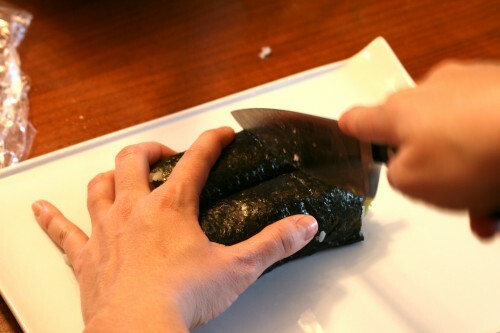 Dip your fingers into the vinegar water, rub your hands together, shake off the excess.Â This will prevent the rice from sticking to your fingers and making a mess.Â Grab a handful of rice and place it directly onto the nori, and spread it gently into an even layer,Â leave a small gap with no rice at the top and bottom edge of the nori. Place whatever ingredients you like in a line down the middle.Â Roll with your thumbs under the edge of the mat, and your fingers holding the ingredients in the middle to get a nice tight roll. Bring the mat up over your ingredients and roll to top. Once one edge of the roll meets the other, give the whole thing a firm but gentle squeeze, slightly pulling the roll back. Dampen your fingers again and tap the ends of the roll so all the filling doesn’t fall out. To slice dip the tip of your knife into the water/vinegar mixture the lift the tip up so the water runs down the knife blade. First cut your roll in half. 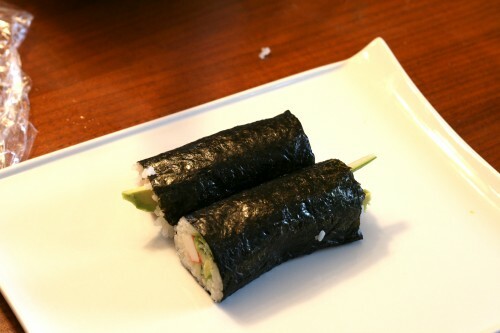 Once roll is sliced in half place the halves next to each other then cut the roll into thirds. Use a gentle sawing motion to cut the rolls. 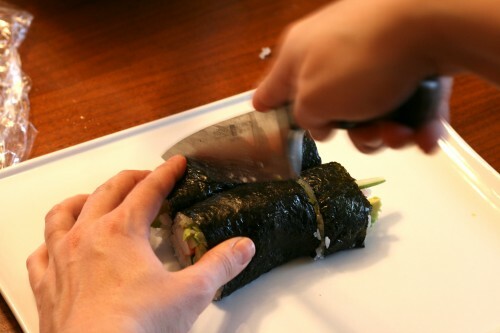 You want the least amount of sawing and downward pressure as possible to avoid a squished roll. 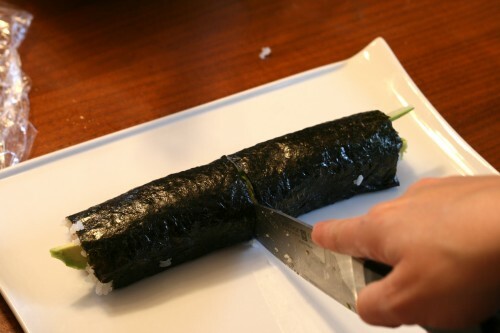 To make a roll with rice on the outside completely cover the nori in rice then carefully flip it over. I filled mine with spicy crab (a little bit of mayo and Sriracha) and cilantro. Topped it with the eel sauce and roasted blackÂ sesameÂ seeds. Â Enjoy with soy sauce, wasabi, and pickled ginger. Yum yum! My girls LOVED the sushi dinner. Especially since they got to pick out their ingredients and use chop sticks. Sasha is even excited to pack some up in her cold lunch tomorrow. Can’t wait to hear what the staff will say about that. To rinse the rice: Put rice in a large bowl cover with cool water and use your fingers stir the rice. Carefully pour of the cloudy water. Recover the rice with water and stir around, drain, repeat 1-2 more times until the water runs clear. Place rinsed rice in a large sauce pan. Add the 2 cups + 2 tablespoons water to the pan. Bring to boil over high heat. Once the water begins to boil turn the heat down to lowest level. Cover and simmer for 15 minutes. Turn off heat and let sit covered for 1o minutes. Combine all the ingredients in a small saucepan, and stir over low heat until the sugar and salt have just dissolved. This only takes a few minutes. Do not let this mixture come to a boil. Set aside to cool until the rice is ready. When the rice is finished cooking, transfer it to a large-wide, non-metallic bowl (wood or glass). Pour half of the seasoned rice vinegar over the rice. Using a wooden spoon or rubber spatula gently fold the rice over so all the vinegar mixture coats and separates all the rice. Give the rice a taste. If it isn't sweet/tart enough add some more of the seasoned rice vinegar. The rice should be shiny and individual grains clearly visible -not a mushy mess. Gather up all your sushi fillings, bamboo mat, sharp knife, clean towel, and a bowl of water with a splash of rice vinegar added (this is to dip your fingers). My youngest son loves sushi. He has his favorite restaurant to get his fill at as this mama wont be making it for him!! But maybe I could use this for one of our cooking lessons to get him interested in cooking again. I kinda have given up. Both of us on the go too much, being ill, all the crazy thats been going on, and then his complete lack of motivation. He wants to learn when he sees how his brother is thriving on his own but…………….